The Patch Central enables to Find a Patch by Name in the Online Database as well as with Category Filter and Sorting. You can do a word Search or Choose to only See Patches by a Specific Type. Preview : If your Pulse2L Software is connected to your Pulse 2 you can instantly preview the patch. The Patch is loaded into the Pulse2L Edit Buffer. 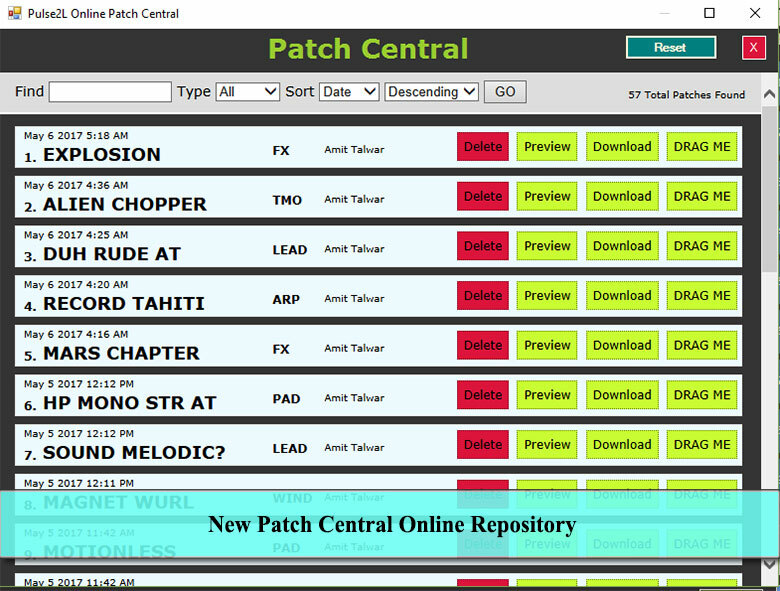 Download : This will Download the Patch file to PatchCentralDownloads Folder in Your Patches. You Can browse these patches offline using the patch Browser and Selecting PatchCentralDownloads as a Bank. Drag Me : (My Favorite) , You can Drag and Drop the Patch from patch Central into a Slot in your Current Bank that way you can build a Custom Bank Quickly. DELETE : This Option will appear fir you on all the Patches that you have shared. 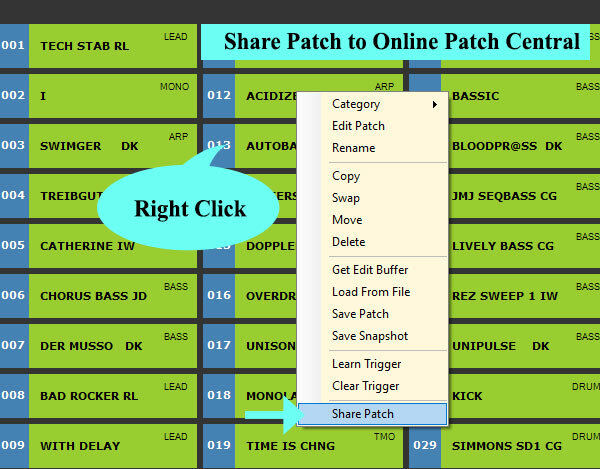 To Share a Patch simply Right Click a Patch and Hit Share as Shown in the image Below. When Sharing for the First Time, a Profile Editor Will open asking your Name and Email. Please Enter your Name as you want to appear. Your email is NOT stored in online database, but is still required to generate your unique signature.